No one comes into your land until they’ve got an agreement to come there or have been invited. If you go into anybody else’s land it’s a battle. That’s one of the strongest laws of the Tlingit. Tlingit warriors wore battle helmets depicting crest animals or ancestors, along with wooden visors, thick leather tunics, and body armor made of wooden rods or slats. They armed themselves with bows and arrows, spears, clubs, and daggers. This helmet depicts a wrinkled human face once embellished with bear fur whiskers and human hair. Pierced hands stretch across the front, joined to a stylized body in the back. Helmets were carved from hard, dense spruce burls to withstand blows from clubs and even shots fired from Russian muskets. Aron Crowell: [Reads from museum repatriation report.] In 1893 Herbert Ogden received a wooden helmet in trade from the leaders of the Ishkeetaan clan from the upper Taku River of British Columbia. Clarence Jackson: T’aaku yikdax ku.oo awe. Naakee. Donald Gregory: It looks like it had a lot of hair on it. Rosita Worl: Yes, beard and mustache. Clarence Jackson: Yoo.at awe kwshe? Kulagaaw atu saaxwoo aya kwshe? Clarence Jackson: It’s a helmet. Rosita Worl: It was initially used in war, but later after they quit using them in war, after they got rifles, they started using them as clan hats in ceremonies. You never say that. You don’t do that in the Tlingit culture. You don’t go around bragging about who you are, you know it. The second one is you will be humble before your people. The third one is you will reach for your fellow man and stand him up with you. The fourth one is you will always protect your fellow man. The fifth one is kind of a strange one, it’s not used any more, never talked about any more, but they used to tell me about it. If you know you are wounded and you are going to die, you fight to your last breath. That’s the fifth one. And once you earned your knife, you will draw that only to protect your fellow man. That goes with the armor and that goes with the warrior. I see a lot people today saying, “I’m a Tlingit warrior,” but they don’t even know the code. George Ramos: Xees’x sateeyi aya yaanaxaanax yeik gisateen. Heenge hel grain.a. Xees’ aya. Donald Gregory: A spruce burl. Delores Churchill: Why did they use a spruce burl? Donald Gregory: Because the grain didn’t break. Clarence Jackson: That’s what I thought. Peter Jack: Sha wduxeeji tlel kuwal’x. Clarence Jackson: Tlel aade kagwaawaal’i ye. George Ramos: Ch’aakw awe kunax litseeni kaa axoo.aa kawal’x sha wduxeeji. Yoo aya ax een kadunik. Yee siteen aade kutlawu ye teen ge? Yaat’aa ku.a yei ksikaak tle ldakat a.
Yaa diyeex’ kaawahayi aa yaa kaasadaa aayi yaat’aa yax koowoox’. Yaa saka aayi ku.a ya yei gook’eink’. George Ramos: Yaat’at’ ku.as yeedat, moss aya atoox’ yein du. Eich it. George Ramos: Janwu doogu axaawu nadulxash.ch. A eeti yanook kaa shakee . . . 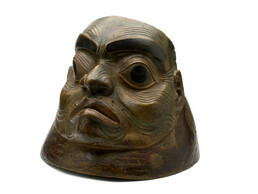 This helmet, collected in 1893 from the T’aaku of the upper Taku River in British Columbia, shows a wrinkled human face that was once embellished with bear fur whiskers and shocks of human hair. (2) Its eyebrows are painted brown, the eyes black, and the lips reddish brown against a background of light green. The figure’s pierced hands stretch across the front rim of the helmet, joined to a stylized body that is painted around the back. The helmet was carved from a hard, dense spruce burl. Tlingit helmets depict human beings or crest animals belonging to the owner’s clan. Tlingit fighters were frightening and impressive to early European explorers, who often described the war helmets they wore as images of ferocious or monstrous beings. Tlingit warfare usually pitted one clan against another, rather than whole tribes or villages. 1. DeLaguna 1972:590-91; Emmons 1991:337-46; Holmberg 1985:22; Hough 1895; Lisianskii 1968:149-50; Olson 2002:109, 478-89.